Great treats that are the rage! 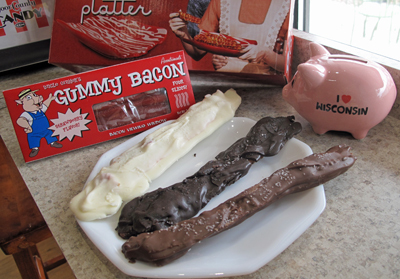 Chocolate covered bacon - yes this is one of the hottest items around! White chocolate, milk or dark! DoorCountyNavigator.com reviewers had to taste test these and these are spectacular! A great combination of sweet and salt (they are sprinkled with sea salt too). Wow! MAKE SURE YOU ASK ABOUT THE DELICIOUS CHOCOLATE CHERRY CLUSTERS! AWESOM E! And Now! The Hello Kitty(tm) Line is Available! See Below! This is a small shop that just got bigger and one that serves up BIG smiles! Door County Candy (formerly known as Copper Kettle Confections) moved one shop over on historic Third Avenue - a bigger shop which is making for bigger smiles! Open year round, and during May - October open from 9am to 10PM (and to 6ish PM the rest of the year), you will not want to miss this unique and fun shop! Have you ever had that gourmet popcorn that comes in big buckets or tins? You know, the tins that are a gallon or more, sometimes have three flavors, and come in tins that depict winter scenes, or general floral scenes etc.? Well, the real gourmet varieties that you order from the companies that actually mix up fresh batches could cost you up to $190 for 6.5 gallons of cashew caramel corn. Delicious, yes! A super gift for birthdays, the holidays, and company functions, yes! And boy if you like this stuff, you really like this stuff! Well, read on – we have made a great discovery that costs a lot less, and can be shipped virtually anywhere! And what about fudge and other chocolate treats? And a whole lot more! Read on! This is one shop that keeps getting better and better! Well, tucked away in a shop on Third Avenue in Sturgeon Bay, we discovered a wonderful confectionary shop loaded with goodies – and the specialty of the house is homemade gourmet popcorns and homemade fudges. This little shop, owned by Terry Ullman, is packed with candies and fun toys and things like giant PEZ, packaged candies like Haribo Rainbow Frogs, bagged nuts and dozens of varieties of other candies. Harney & Sons teas, Door County Coffee Company coffees, and Jelly Belly pre-packed bags and bulk Jelly Bellies in every conceivable flavor tempt you at every turn. And there is a large selection of salt water taffy too - and you can pick from about 20 flavors and get what you want! In fact, Sturgeon Bay has had a display, “the Sturgeons of Sturgeon Bay” (kind of like the cow thing in Chicago a number of years back), where shops dec orate a huge sturgeon any way they like. They will be auctioned off when the “season” is over. Well, Terry put together a patriotic sturgeon covered with red, white and blue jelly bellies – 15,000 of them (see picture) – fabulous!! This sturgeon drew so much attention that Terry decided to buy it at the auction and permanently display it at the shop – you have to see it! These sturgeons were auctioned off, benefiting charities. Terry has a trivia question for you: “What do you get when you combine 15,000 jelly beans and a fish? Pop-in the shop for the answer! Chocolate, or Sweet Chocolate! For Companies! Birthdays! Weddings! Door County Themed Baskets! Special Treats! Lots More! Door County Candy has added a line of chocolate now too! I mean chocolate that can be imprinted with company logo in all kinds of shapes - like Cds, imprinted chocolate business cards, chocolate logo cookies, custom foiled pieces or bars and even custom wrappers!! These are great holiday gifts that companies can hand out, or great trade show gifts as well. Or great for your special occasion like a wedding, anniversary party etc. - you get the idea! Let your imagination run wild and call Terry about lead-time and so on. Some stock items can be shipped quickly! Give Terry a call or stop in the shop! Be a hero – give the best gifts for a lot less. Terry’s claim to fame is his fresh mixed gourmet popcorns and real homemade fudge. The gourmet popcorn is truly gourmet – and he makes it all himself- in the shop. Once you have tasted, for example, Door County Cheddar Cheese Popcorn, you will know why customers are planning special trips to the Door County Candy for this crowd-pleasing favorite. You’ll love it, and Terry will ship it virtually anywhere- perfect gift, great price, and super good! Discover the power of Door County Candy treats when you give them or serve them for your next event. Anyone would love getting these special treats! Our fudge testers, who are tough on fudge, tested the Door County Cherry and the Peanut Butter chocolate. The Door County Cherry, rich and creamy fudge topped with giant cherries, was nothing less than awesome. The Peanut Butter (# 1 seller by the way) was also rich, flavorful, and loaded with peanut butter cups – wow – this is excellent fudge! Other candies are available in the shop like chocolate covered pretzels, chocolate orange peels, cashew cups, butter almond toffee, chocolate cherries, blueberries or strawberries. You can also order up some Cedar Crest ice cream, malts, shakes, sundaes and floats. Mackinac Island Fudge, Blue Moon, and Door County Cherry are just a few of about 16 flavors available in peak season. There are even a few old fashioned booths where you can have a sit and enjoy your ice cream treat! On our recent visit to the shop, we discovered the hot Hello Kitty(tm) line is available at Door County Candy! This is a line of branded items from plush toys, to handbags, hair accessories, pillows, cell phone cover bags and more that appeal to both little girls and grown women alike! Call Terry and ask about his large selection of Hello Kitty™ items. * We love your shop! * This is THE place! * We have to bring our grand kids here! Door County Candy is a fun place – not stuffy – just fun folks serving up old fashioned fun! You deserve it! Open limited hours in witner too! And on your next visit, save a little money! Clip out below and bring it into the shop – or bring the whole review in! And tell them DoorCountyNavigator.com sent you - that helps keep this site alive & well and free for you! Thanks!